I know I must be one of the last bloggers to make a burlap wreath. Why did I wait so long? It’s sooooo easy and is almost fool proof! And, here’s the best part, it can be re-decorated and re-embellished for every season! 1. Secure the end of the burlap to the metal wreath form. Weave it in and out as shown. This will secure the burlap. Bring the burlap under the outside slat and up through the first space. Pull the burlp through to make a loop (about 3 inches). Keep pulling the burlap through the spaces between the slats to make loops. When you have finished the first row, weave and loop in the other direction to make a second row. Continue all the way around the wreath form pushing the loops close together as you go. When the wreath is done, cut the end about 4 inches long and weave it through the wreath form to secure. Add embellishments. Use wire to secure. It’s that easy. Making this wreath took about 15 minutes. I’m giving this one to my sweet daughter-in-law, Abigail. I’m making 2 more wreaths this weekend! You can use less burlap for a soft floppy wreath. Or more (like I did) for a tighter, fuller look. 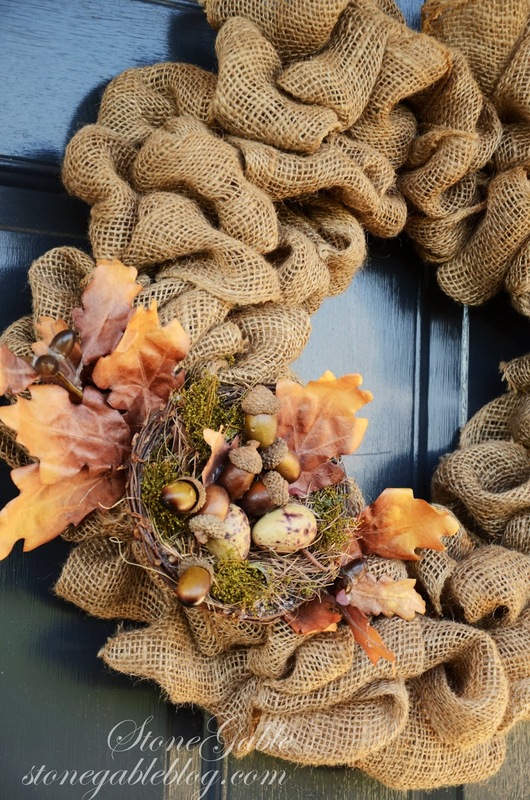 Exposing the burlap wreath to the elements tends to make it droopy. If it gets wet, bring it in and let it dry. When it is dry fluff it up. If your wreath gets wet you can turn it upside down and dry it on LOW with a blow dryer. Do not hot glue embellishments to the wreath. Wire any embellishments on. Hot glue will damage the wreath and make it hard to change the decorations. OMG! Thank you for finally making this wreath easy to understand! I have watched every tutorial out there & thought I was just a total loss! If you want a great place to get burlap, a wonderful lady Teresa, has an Etsy shop called House of Burlap! Hundreds of colors, its amazing, and her colors are unbelievable. I’ve been buying so much burlap, dying to make these wreaths, but failing miserably!! Now I think I will be able to put all of my “stock” to good use”! ? Thank You so very much!! 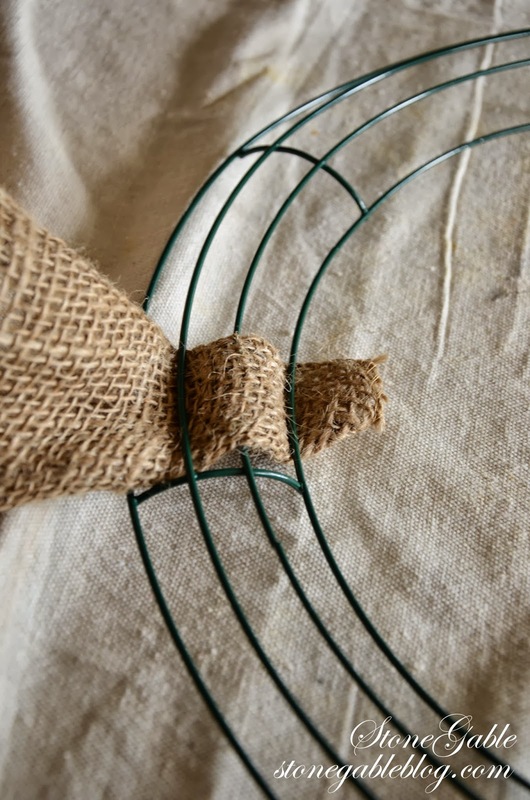 If I understand correctly how the burlap is looped through the wire openings, 1) The burlap will be “stressed” somewhat from pulling it through the many openings … does it get kinda’ fuzzy, for lack of a better word? And 2) The *beginning end* of the roll of burlap will thread/loop through all the openings & ultimately be back next to the place you started ~ correct? I don’t know if my interpretation of your instructions is correct, or if my attempts at describing it are understandable!? It seems that any other way of looping would involve taking the burlap off the “roller” or cutting it into smaller lengths. I get the concept of the looping and weaving, but you can see the wire in between the loops. What am I doing wrong? Ashley, however you do it is fine! If you see the wire you are not making if full enough. Add more loops! I’ve got to try this. I’ve wanted a burlap wrath forever but thought it would be too hard to make. Thanks for the inspiration. What a lovely idea! I would so love to try it, but we don’t get wreath forms here in India. Would you know of sources from which I could purchase some online please? I love your blog! The entire layout is so tasteful. Yo can be sure I will be a frequent visitor. Cheers! Hi Wendy, you can probably go on line and do a google search for the wire wreath forms. I made one like this and it turned out cute. I’m wondering how you transition to the next row. I think I wasted alot of burlap. I started at the inside, made the 3 loops, twisted it to secure it and then started over at the inside with my loops. You said the you weave and loop in the opposite direction for the next row. Can you please elaborate? 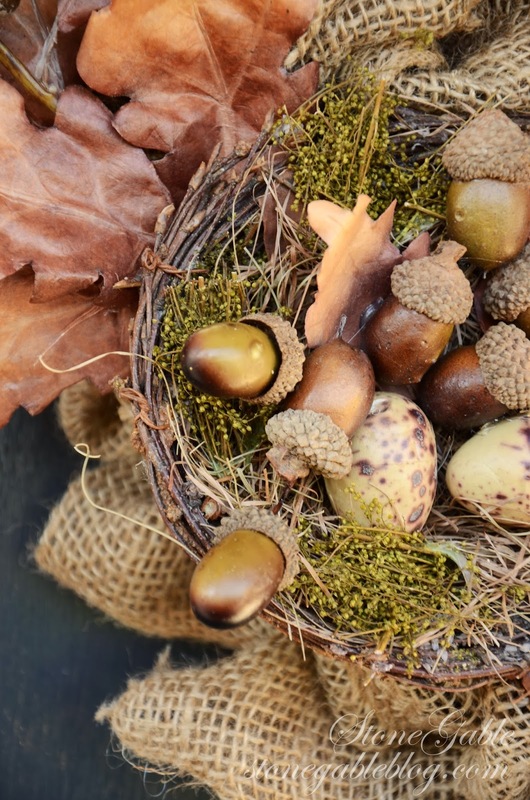 I love your nest and acorns… Perfect for fall!! Thank you! I’d almost have to show you myself. When I finished the row of loops I just went the other way, skipping the first hole. Sorry, that’s the best I can explain it! I don’t understand. You don’t cut your burlap + you don’t take it off the roll when you weave. so how do you weave it thru? Don’t cut the burlap. Keep weaving it off the roll. You really need to try it to understand. got it and made one. wouldn’t you know I gave away all my wreath forms last year. will have to keep an eye out for more. Thank you for this! I was having a hard time `getting it’, because it is so easy! Your pictures really helped! I used ivory colored burlap, finished it today & its hanging on an inside door! Love the look! I bought a 12″ frame and 4″wired burlap. Like some others, I can’t figure how to continue going without cutting burlap. It’s a 7 yard roll. I love your look though, and the nest just makes it!! You don’t cut the burlap you just loop it around. Maybe my frame is too big. I’m using 5″x10′ burlap and I’ve only filled in 2 sections of my form! It will take me 4 1/2 rolls of ribbon to complete my wreath! I think the problem is that you are packing it too tight. Start over and pack it half as loose. And you could also try a smaller frame. Cute wreath! Did you use 10 or 20 yards for this wreath? Josh, I’m not sure! I just used 3 packet of what my craft store had! Sorry I can’t tell you more. 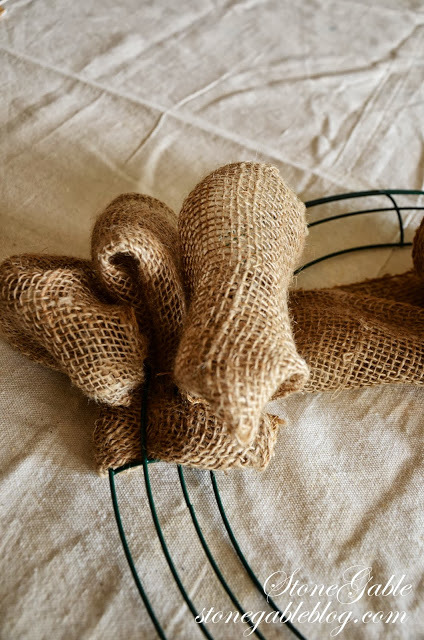 Did you use wired burlap? Or just the plain? Good question, Deborah, The burlap is NOT wired. It makes soft loops on it’s own! Hope this helps. Was your burlap wired or unwired (if that’s a word) Saw both at the craft store and didn’t know which one to get. Yeah I need to know what size wreath form to use! what size wreath form did you use? I love your wreath and can’t wait to make one. I am a bit confused though as to how it all stays securely in there without falling out. If you too the second picture again but held the three loops apart it would help explain how you loop it through and keep it tight. And how do you deal with the entire roll as you go? I need more pictures with the looping details I guess. My frame size might not be right for your door. It was a run of the mill medium frame. I just got another, bigger one. 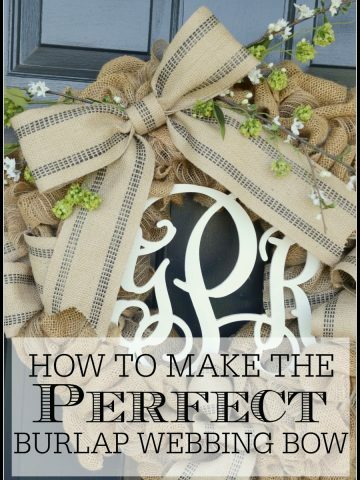 I would suggest measuring your door and remember the burlap will add about 4-6 inches in width when it is done! Buy a wreath form with this in mind! Hope this helps! Thank you so much appreciated ” )wish me luck I sure hope it comes out nice!! What size is your wreath frame? Thanks so much!! I just don’t understand this .I must be missing something somewhere.I have it started, do you go down all three spaces and then what,and how can you do a second row? Please help. Thank you yours is beautiful. Beverly. 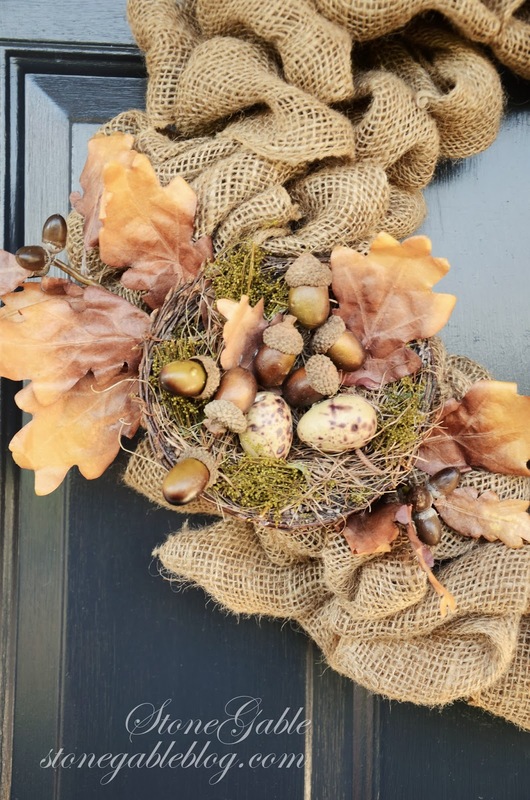 Love your burlap wreath creation Yvonne! The acorn nest is such a fun, fall touch! I’ve been longing to make one for awhile, but didn’t think I could do it. Thanks for the tutorial! GORGEOUS Yvonne! I love it!! Love it Yvonne! The little bird’s nest is so cute in it. This is stunning! I love how simple it is to make, but looks so elegant. I made burlap wreaths couple of years ago but I tied knots of burlap cut into strips in the wreath form. Messy, Messy, Messy! Looks GREAT! 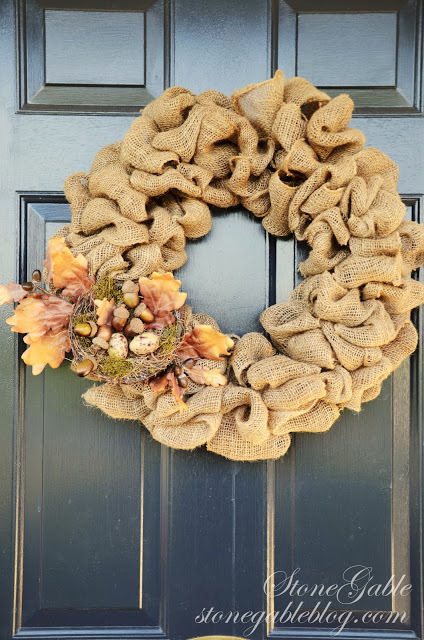 Beautiful burlap wreath!!! Hope to make one soon!!! I am wondering what size of metal wreath form did you use? Thinking if I get the wrong size, will I have enough ribbon. Thank you for sharing the directions. Yvonne, that looks like a fun project. Designer look for sure…love the nest on it! Thanks for sharing, have a fabulous week! 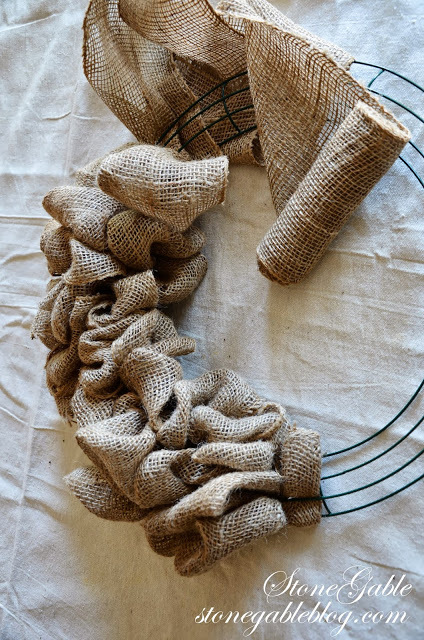 I have seen a million tutorials on this and what I still don’t get is do you cut the burlap because how do you weave such a long piece through the wreath? That’s the part I just don’t get! It is beautiful! Thanks. Thanks!! I’m going to try it! Great question! If you look, you can see that I don’t cut the end attached to the roll. Because you are looping the burlap you don’t need to cut it. You just make one loop in the open space between the slats and then loop the burlap through the next open space and keep going. It’s very very forgiving. When you make one you will get it! I hope this helps. I have the first step, but then you don’t show the 2nd step, just on further down in your looping, I don’t understand what im supposed to be looping… the same end I use first? or pull it all the way through??? Love the embellishments on your wreath. I made three burlap wreaths..two for my daughter and one for me. They are so easy. I prefer using more burlap like you.BTW..your tutorial is the best. 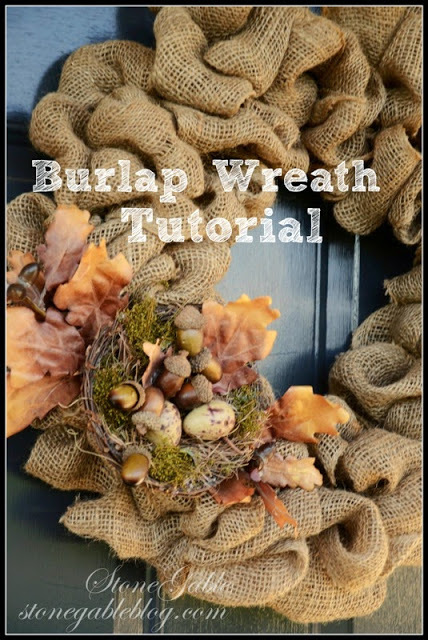 You are most certainly not the last one to do a burlap wreath. You made it look so easy! I still do not have a wreath up on my door. (bad blogger) I’ve changed mine up 3 times and still don’t like it. I guess I have a weekend project to do too. 😉 By the way, thanks so much for your sweet comment on my Upcycled Sweater post yesterday. It made my day! Have a wonderful week! My favorite part of the wreath are the acorns. They give your wreath the feel of late Fall . . . Thanksgiving. It’s beautiful. Great ‘caring for burlap’ tips!